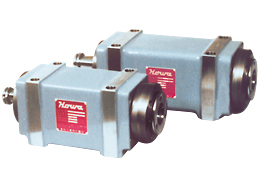 Machine Tools | Our Products | Howa Machinery, Ltd.
Howa Machinery's lineup of machine tools is underpinned by a wealth of expertise and rock-solid technologies and used by a truly wide range of industries due to its high productivity, reduced energy use and flexibility. 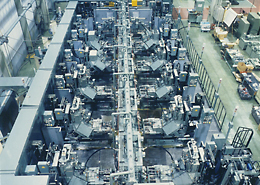 To establish high reliability, we manufacture high-speed and high-precision transfer machines, highly flexible FTL/FMS, and a supporting case of #30 and #40 machining centers as well as factory automation standard machine tool units for transfer lines, optimized turret head machines capable of multi-face and multi-axis machining and others. 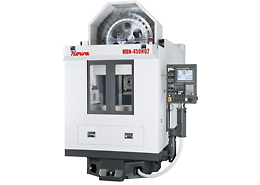 The MBN Series #30 and #40 horizontal machining centers can accommodate any high-productivity mass production line that machines aluminum engine and transmission parts for automobiles and motorcycles, while the KIWAMI Series offers all-purpose-type #15 and #30 vertical machining centers capable of high-speed and high-precision machining of electronic components and automotive parts. Having adapted continuously to changes taking place in the automotive industry, our transfer lines represent a culmination of machine tool technologies that can accommodate high-precision and high-efficiency manufacturing on a variety of engine and transmission mass production lines. In line with the rapid advancements in machining centers that enable machining on a mass production scale, our selection of standard machine tool units for transfer lines makes it possible to create more flexible combinations on the production floor to support mass production. Machine Tools Team, Sales Group, Machinery Dept., Howa Machinery, Ltd.